Fozzy singer Chris Jericho, who is also a WWE wrestler, is animated and candid. So it was only fair that Noisecreep shoot some rapid-fire questions at the good-natured man of many hats. Fozzy's last album was named 'All That Remains,' just like one of our favorite Massachusetts metal bands. 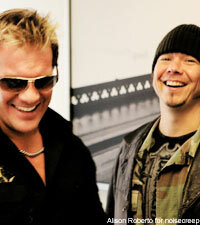 Fozzy also have enjoyed plenty of A-list metal guests on their records. These were just a few things we had to ask Jericho about. And boy did he answer! On the band All That Remains: "I don't know them. Our record came out right before or around the same time as theirs ... they had a guitar played named Mike Martin, and we had a guitar player Mike Martin, so I think it's only fair that All That Remains name their next record 'Fozzy!'" Bring on Dave Mustaine: While Fozzy albums have featured guest appearances from the likes of Zakk Wylde and Annihiliator's Jeff Waters, Megadeth's Dave Mustaine is on Jericho's 'dream list.' He said, "I'd love to have Dave Mustaine play on a song. I'm a huge fan of Iron Maiden, so maybe we can have Steve Harris do a bass part? I would love to work with Zakk again, but as far as someone laying down a solo, I'd like to see Dave Mustaine do something." Avenged Sevenfold Are in His Top 15: "I love Avenged Sevenfold to the point that they are in my top 15 favorite bands of all time. With the passing of [Avenged Sevenfold drummer] the Rev, it's a transition phase for them, but they will hopefully find someone to match up with the Rev. M Shadows' voice isn't the barking and growling that everyone is doing. I hate that stuff. This may sound hypocritical since I said I hate the growling, but I love Arch Enemy, even though they have a lot of growling vocals. I love [Arch Enemy frontwoman] Angela. But Avenged is my favorite of the new crop." Advice for aspiring wrestlers/singers: "Anyone who tells you that you can't do something is only saying that because they failed. You can't be scared to fail, or you will never try anything."